Well…this was an interesting result on this card on eBay today. I do not actually have this card and threw out a bid of a little over $10. Apparently I was not alone…as several others clearly don’t have this card either! After 9 bids the card ended up at $16.53 plus a $1 for shipping, so $17.53. I am not sure what this card has gotten in the past, but I suspect that it will continue to garner this kind of price based on the level of interest here. As a comic book collector (check out my other blog linked below)…I was reminded of this just the other day. I was going through my collection and came across a Batman book from the 1970’s that I purchased about 10 years ago for no reason other than I thought the Neal Adams cover was really cool and the book happened to be in really nice shape. That book sells for a minimum of $200 today…I paid $13. Blogging here and at Sundry Collectibles on comic books, vintage airline postcards, and other stuff! 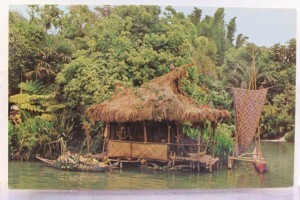 This entry was posted in Disneyland, Disneyland Postcards and tagged B-Series, Jungle Cruise, Market Update, Price Guide. Bookmark the permalink.